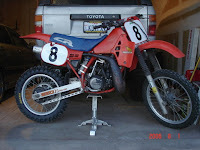 Why did it take me so long to get back into dirt bikes? Thanks to Brayden, I have found my way back to the sport. 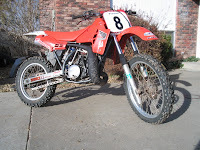 After we found a killer deal on a 1998 KTM 50cc dirt bike for my son, I went searching and found this 1984 CR250 for myself. Basically it was the cheapest thing that I could find that ran and still had respectable power. When I bought it around September of last year, it ran great and served me well for a couple of months, but I couldn't resist tearing it apart to see if I could get more power and performance, and update the look a little if I could. 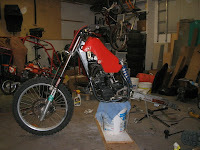 To help with the power and performance I installed some aftermarket Boyesen Power Reeds, cooked the old exhaust pipe out in my wife's stove, shortened and repacked the silencer, re-sealed the fork, and rebuilt and tuned the carb. 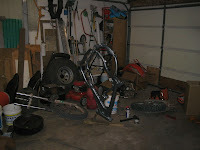 The updated looks came from a 1990 seat and rear fender that I found on ebay. I had to do some trimming and minor fabrication, but I think it turned out pretty good in the end. I am happy with the end result, and should serve well enough for a while. It's been fun to change things up a bit. The family seems to like blazing the trails with atv's better than the rock crawling.